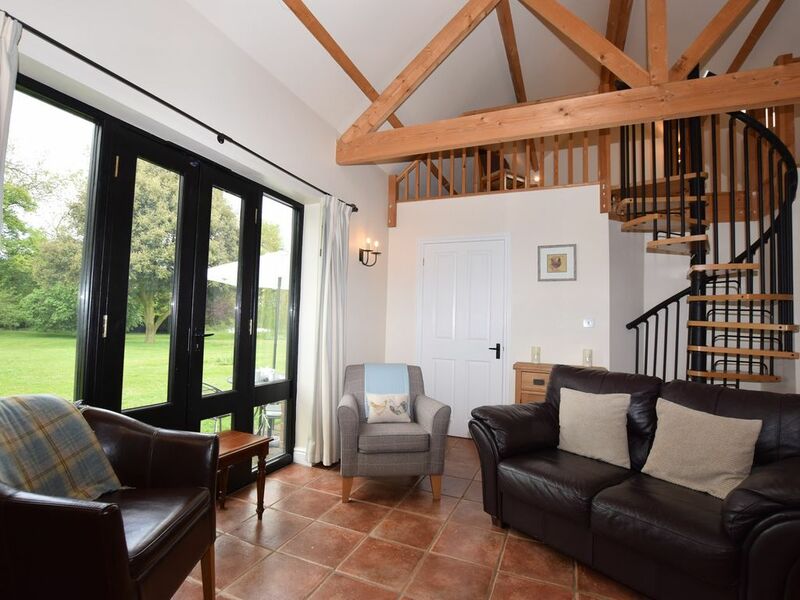 DELIGHTFUL SEMI-DETACHED LODGE WITH VIEWS OVER THE LAKE IN ESSEX A timber framed barn nestled within the owners estate has been tastefully furnished and is located on a working farm. The property overlooks a 3 acre stream fed fishing lake. Approached via winding lane through the countryside Situated in the Hamlet of Duddenhoe End a few miles from the village Arksden. The property is the ideal base from where to relax and explore the local area including delightful local pubs and beyond visit the pretty town of Saffron Walden with thriving high street for shops and places to eat. Slightly further afield lies Cambridge with the famous university and punting on the River Cam. London is easily accessible from the local train station. Local attractions include National Trust and English Heritage properties at Audley End and Wimpole Hall. The Imperial War Museum at Duxford with planes ranging from the Spitfire to the iconic Concorde. Leisure facilities: fishing is available by arrangement with the owner. On entering the property there is an open plan lounge kitchen and dining area the lounge offers comfortable sofas and chairs TV/DVD whilst the dining area provides a great place to enjoy an evening meal. The kitchen area is well equipped with electric oven and hob fridge washer/dryer. There is a shower room with shower and WC. On the ground floor you will also find 2 bedroom a double bedroom with great views over the garden and a twin bedroom. There is a spiral staircase leading to a mezzanine floor where you will find a sofa the ideal place to relax with a book. Outside: Enjoy the vast shared garden with views over the lake a small patio area with garden furniture and BBQ. To the side of the property is off road parking for 2 cars. Additional info: Care to be taken with small children around the lake. It is a very nice house. It is very quiet, the only noise you might hear is from the goose around the lake. It is in the middle of nowhere, but Saffron Walden is only 15 minutes away. You can travel from there to London by train in less than an hour, also Cambridge is close by. The house contains a bedroom with a double bed, a bedroom with 2 single beds and an open space above the bedrooms, which is reachable via a small spiral staircase and has another single bed.